The conventional wisdom is that running is too hard on the joints, especially the knees. Therefore, many of us who might really enjoy running and the great cardiovascular workout it offers have shied away from it and chosen lower impact activities instead. But if you like running, here’s some good news for you. New research suggests that not only is it possible that running doesn’t harm your knees, it’s possible that it actually might be beneficial. The study, which took place at Brigham Young University in Provo, Utah, found that running may decrease inflammation within the knee joint rather than increase it, which is a commonly held belief.1 The subjects were a group of men and women between the ages of 18 and 35, all recreational runners who were in good health. Fluid samples were drawn from the participants’ knee joints, once before and again once after they took part in a 30-minute run. These samples of synovial fluid, which helps to reduce friction among various pieces of the cartilage in the joint, were analyzed to measure the levels of two specific proteins. The proteins, granulocyte-macrophage colony-stimulating factor (GM-CSF) and interleukin 15 (IL-15), are markers of inflammation in the knee joint. In the case of both of the proteins, levels were notably lower after half an hour spent running than they had been prior to the activity. This may indicate a drop in inflammation, which is important because it can cause damage over the long term such as the wearing down of cartilage. To ensure that the change in protein levels was truly related to running and not some other factor, the scientists conducted a controlled version of the experiment. They collected synovial fluid samples from the knee joints of the volunteers again, but this time it was done both before and after a 30-minute period of seated inactivity. In this case, the measurements of the proteins remained the same after sitting as they had been before. Before we jump to any conclusions, however, we have to note that this study does have some considerable limitations. The biggest problem is its size, with just six subjects in the population sample. It is difficult to say any results are conclusive when there are so very few to base it on, even if all six did have the same outcome. Another issue is the relative youth of the participants. It is possible that in younger, healthy knees with little existing damage, running has a positive effect that may even be protective. However, it is tougher to draw any conclusions about how running would affect the knees of someone a little older or with pre-existing cartilage damage. 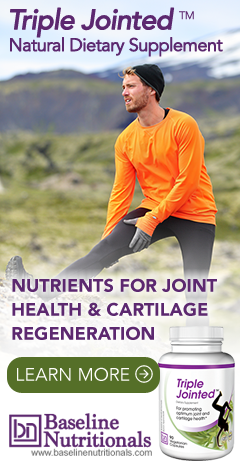 It would be very interesting to conduct a follow-up to this study with a much larger pool of volunteers that includes a wide range of ages and perhaps even some individuals with minor problems in their knee joints. The reason behind these results is actually quite interesting. Yes, it’s true that runners hit the ground with more force than walkers--about eight times your body weight while running vs about three times while walking. But you strike the ground less often while running, for the simple reason that your strides are longer. As a result, you require fewer steps to cover the same distance when running versus walking. You also experience any pounding for a shorter period of time because your foot is in contact with the ground more briefly with each stride. The net result of these differences, is that the “total” amount of force moving through your knees over “any given distance” is equivalent whether your walk or run. In any case, running may not be the best option for anyone who is already dealing with knee problems. But if your joints are healthy and you’re looking for a great workout that burns more than 200 calories in just half an hour (at a pace of five miles per hour), you may be well-suited for running. It is ideal in many ways, as you can run alone at your convenience, run outdoors or indoors on a treadmill, and it releases endorphins that are known to enhance your mood (hence the term runner’s high). You don’t have to be a long-distance runner to get a lot out of this activity. 1. Hyldahl, Robert D.; et al. "Running decreases knee intra-articular cytokine and cartilage oligomeric matrix concentrations: a pilot study." European Journal of Applied Physiology. December 2016. Accessed 24 December 2016. http://link.springer.com/article/10.1007/s00421-016-3474-z. 2. Chakravarty, Eliza F.; et al. "Reduced Disability and Mortality Among Aging Runners: A 21-Year Longitudinal Study." JAMA Internal Medicine. August 2008. Accessed 25 December 2016. http://jamanetwork.com/journals/jamainternalmedicine/fullarticle/770349?resultClick=3. 3. Hunter, David J. and Eckstein, Felix. "Exercise and osteoarthritis." Journal of Anatomy. February 2009. Accessed 25 December 2016. https://www.ncbi.nlm.nih.gov/pmc/articles/PMC2667877/. Is it the movement compared to the sitting rather than specifically the running? For example, maybe walking would accomplish the same results?